A hundred years ago this week, Serbian nationalists assassinated the heir to the throne of Austria-Hungary and his wife, setting off a series of events that led Europe into war. 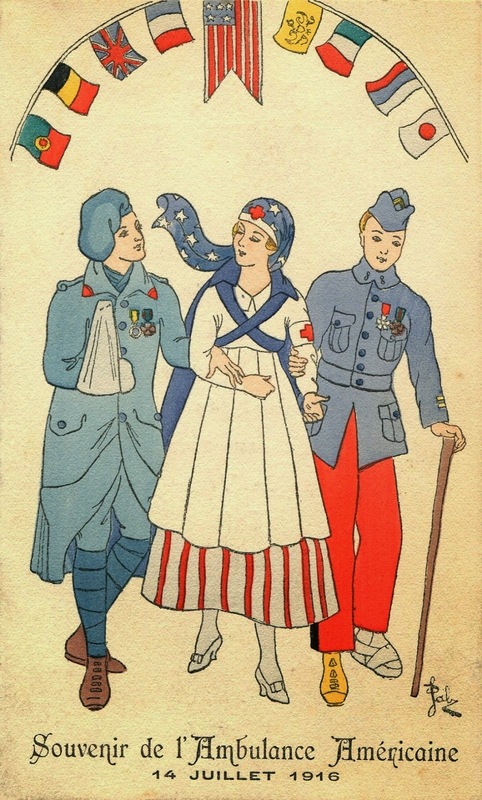 Although the United States did not enter the conflict until 1917, Americans living in Paris quickly sprang into action, establishing a military hospital for wounded French soldiers. 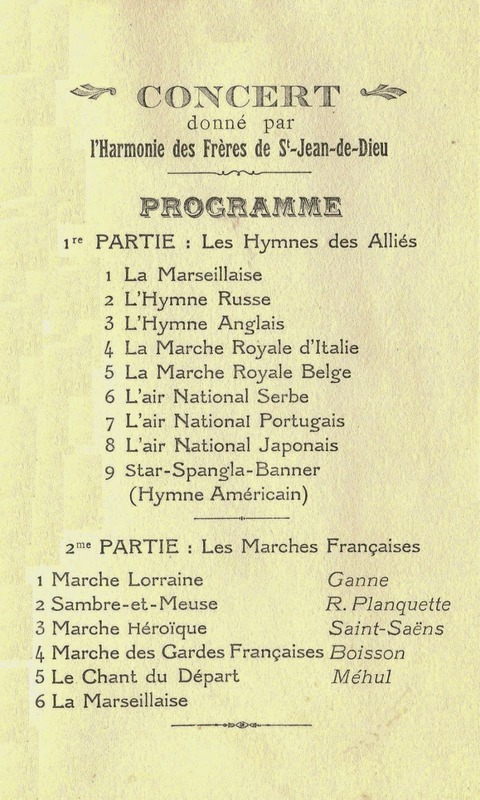 Recalling this humanitarian effort, three menus from the hospital’s annual observance of Bastille Day unwittingly reflect this exhausting war of attrition. 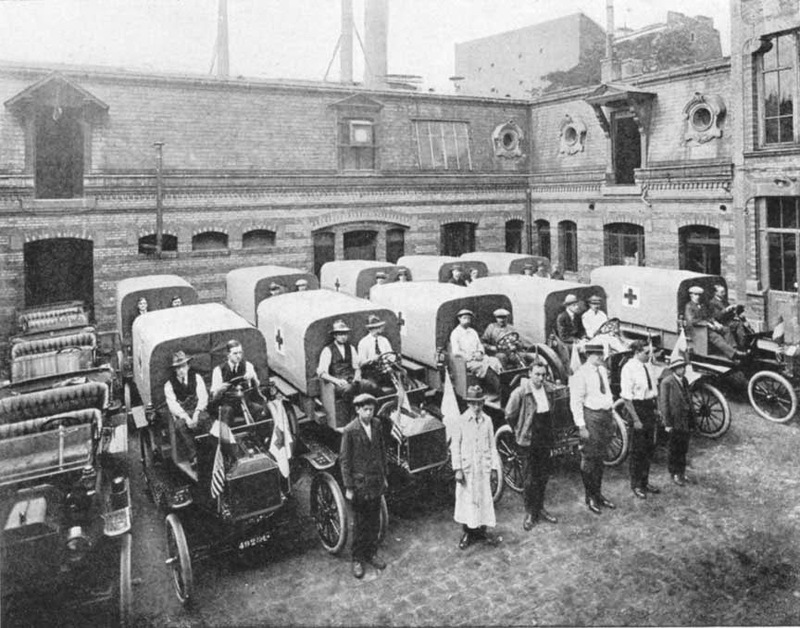 During the Franco-Prussian War in 1870, the American colony in Paris set up a small tent hospital called an “ambulance.” In August 1914, inspired by this example, local expatriates established the American Ambulance Hospital, or Ambulance Américaine, in the Lycée Pasteur, an unfinished high school in Neuilly-sur-Seine. 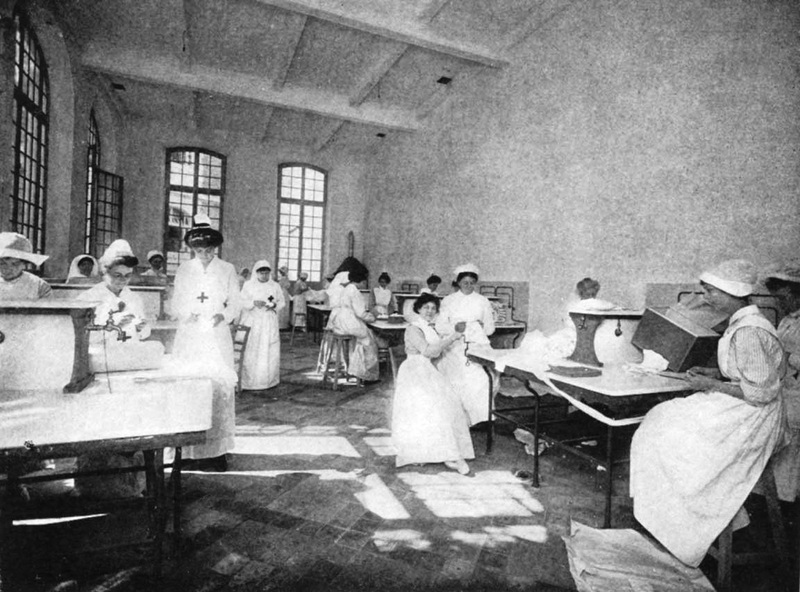 Situated in a western suburb of Paris, this spacious building was transformed into a 600-bed hospital and staffed with more than a dozen physicians, along with 120 attendants and nurses. 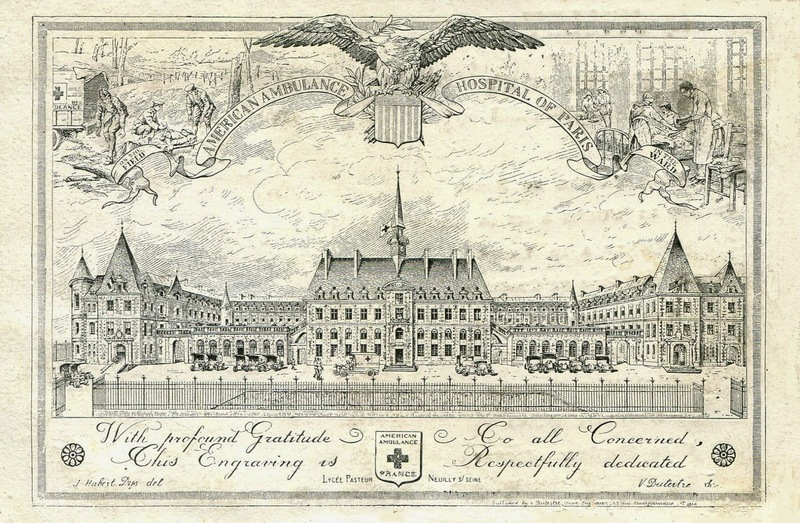 In addition, the hospital had a contingent of American volunteers, including some doyennes of high society, such as Mrs. William K. Vanderbilt, the 53-year-old wife of a grandson of the founder of the Vanderbilt dynasty. 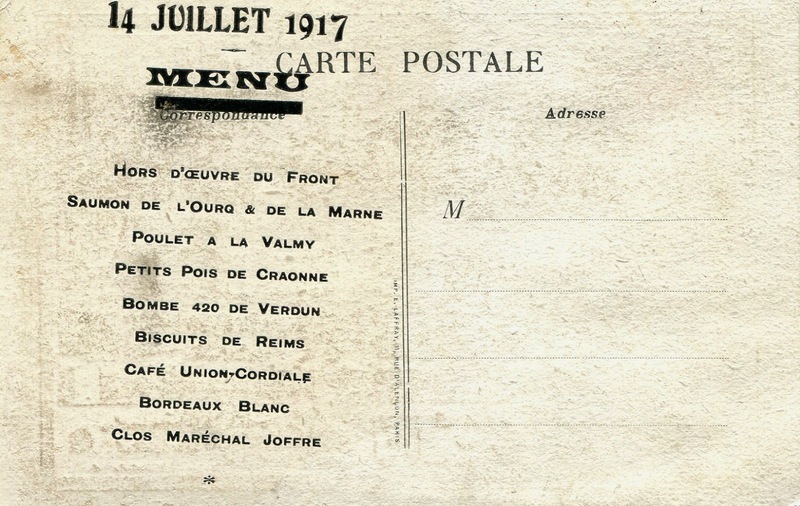 An “automobile service” was also organized to transport wounded soldiers from the battlefield, and by 1915, with casualties rapidly mounting, the French army agreed to let the hospital drivers come closer to the front lines.1 Dated July 14 of that year, the special menu on Bastille Day features dishes named for the allies, victory, and Joseph Joffre, the French general who regrouped the retreating allied armies and defeated the Germans at the First Battle of the Marne. Most of the dishes shown above specifically refer to the First World War. The roast chicken is named in honor of the poilus, an informal term then used for French infantrymen (literally meaning the hairy ones) and the fried potatoes are christened after the murderess trenches that came to symbolize the long stalemate on the Western Front. 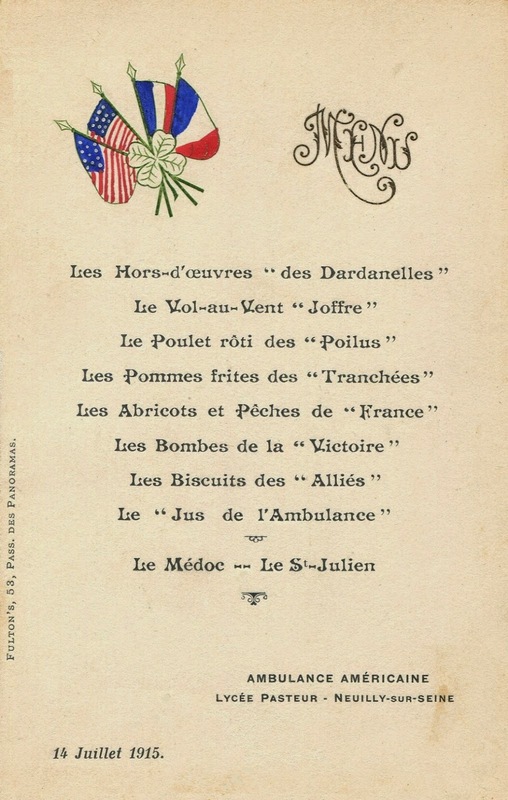 The charming illustration on the lunch menu below from Bastille Day in 1916 does not convey the deadly carnage brought about by military innovations like machine guns, tanks and poison gas. On some days, as many 20,000 men were killed in a single engagement. In April 1917, the United States declared war on Germany and the other Central Powers, and began to raise a large military force. By then, one out of every twenty French males of all ages had been killed in the fighting, causing some units of the French Army to mutiny. 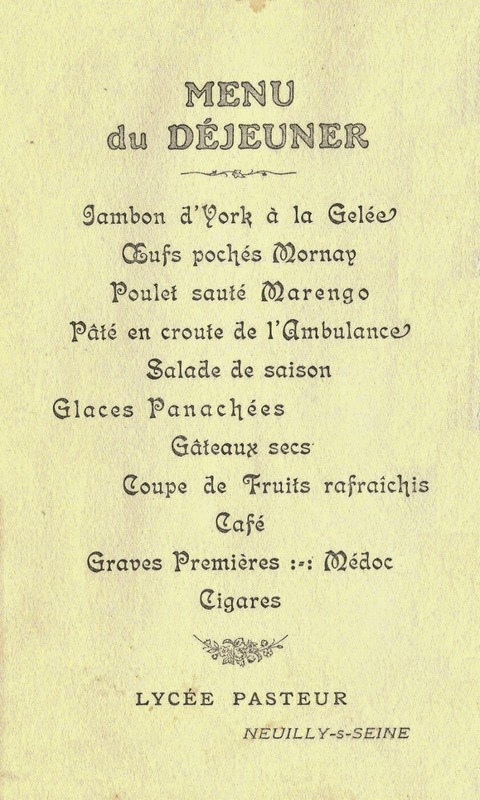 The hospital menu on Bastille Day that year was printed on a postcard showing its magnificent building which resembled a 16th century château. On the reverse, the bill of fare is printed askew, as if to express the weariness of a war now entering its fourth year. In November 1917, the American Expeditionary Force entered combat for the first time. It was called The Great War, even as it was going on, for by the time the guns fell silent in the fall of 1918, over 16 million soldiers and civilians had died.2 Thinking back to that day in late June 1914, when the Austrian archduke and his wife were murdered in the small Balkan city of Sarajevo, people were shocked but not particularly worried, unable to envision that this event would spark a horrific war, killing an entire generation of men on the fields of France. 2. The total number of deaths included about nine million military personnel and seven million civilians. 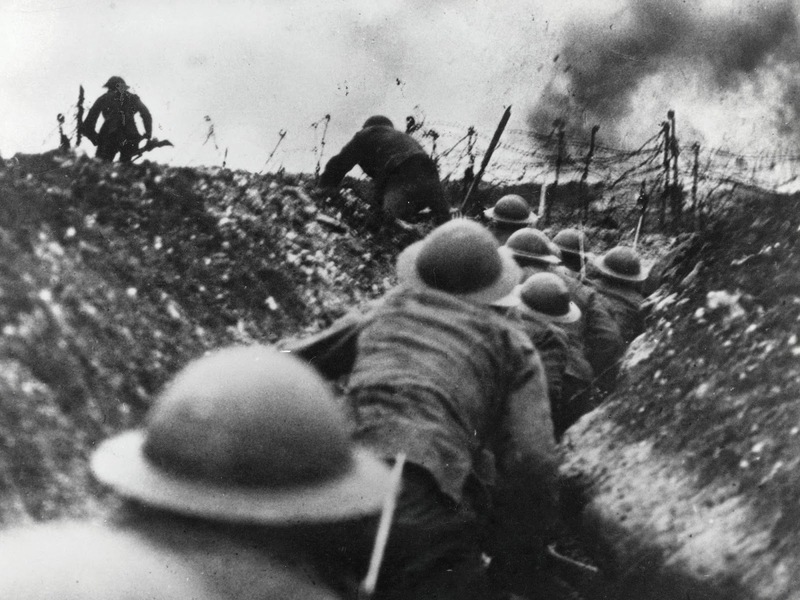 Unlike wars in the nineteenth century, when the majority of deaths were due to disease, about two-thirds of military deaths during the First World War were in battle. Really interesting post, thanks so much. Really interesting read and blog.